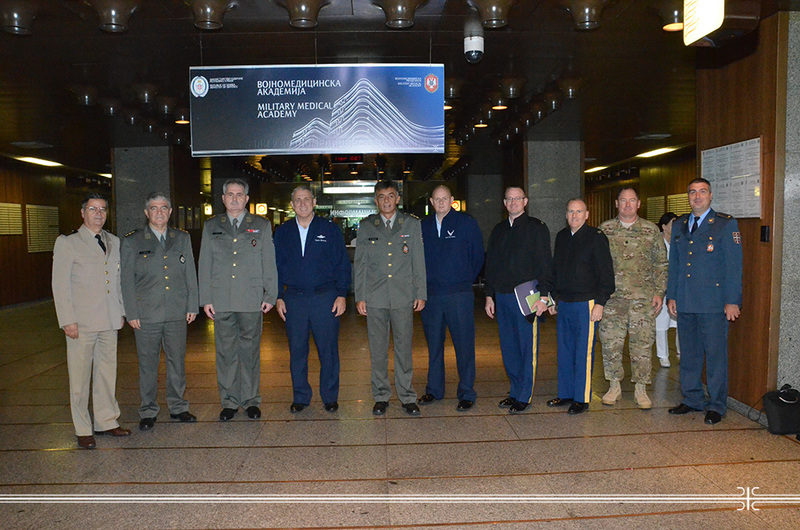 Acting Head of the Military Medical Academy Colonel Prof. Zoran Segrt and his associates received the delegation of the Ohio National Guard led by Commander of the Air Force, Brigadier General Steven Markovic. The meeting was attended by the Acting Head of the Military Health Department Colonel Ugljesa Jovicic. The topic of discussion was the military medical component of the cooperation of the Serbian Armed Forces and the Ohio National Guard, which has been intensively developing since 2006 within the State Partnership Program between Serbia and Ohio. It was concluded that this type of professional communication is very beneficial for both sides, and that the joint medical exercise, which are part of a bilateral cooperation plan, are one of the best ways of exchanging knowledge and experience in the field of military medicine. NG Ohio delegation was presented with the work of the military health service and Military Medical Academy, especially training center for medical personnel of the Military Medical Academy, and they had the opportunity to visit the ER Center, Clinic for Anesthesia and Intensive Care, Clinic for Emergency Internal Medicine, Center for Hyperbaric Medicine and the Institute of Radiology at the MMA.